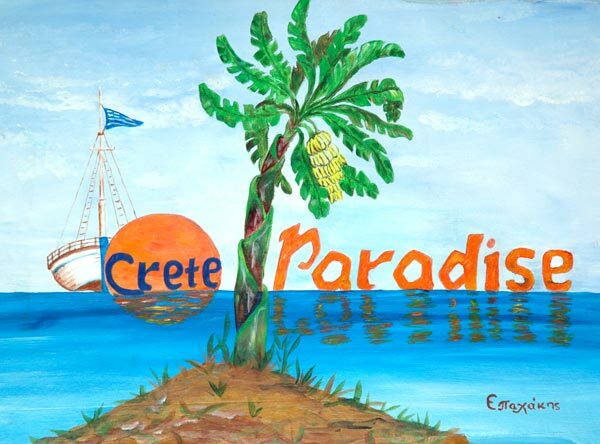 Welcome to Paradise Villas in Crete! If you are looking for a warm winter getaway or a cool, hospitable place for those burning summer months, we cordially invite you to come to Pitsidia, Heraklion, Crete! In one of the southernmost parts of Europe (in the village of Pitsidia in southern Crete) a small, haven-like settlement complex comprised of three apartments (houses) can satisfy your every desire and fulfill your dreams! The creator of this paradise is Manolis Pahakis, an artist-creator who, by using earthly materials (dirt, stone, wood and more) as dominating materials and working with imagination, zest and soul managed to build apartments of high aesthetic quality both interiorly and exteriorly. Apartments that are a haven and place of relaxation and calming of the body and soul built under the clear-blue sky, among the olive trees, for those who love and search for something beautiful, calming and true! The settlement complex of three apartments, all fully equipped and built with excellent taste opened its doors and graciously welcomed its first guests in July 2009! The settlement complex of Manolis Pahakis is situated in a calm and isolated part of the settlement of Pitsidia and is very near the amazing beaches of Matala, Komos and Kalamaki. It is also very near the archaeological sites of Phaestos and Agia Triada. The infamous beach of Matala is only 2 kilometres away from the villas. The enchanting beach of Komos is 500 metres from the villas. The beach of Kokkini Amos, which is the third ranking nudist beach in the wrold, is only 2 kilometres away from the villas.